← Fearnan: the story of a village of northern Perthshire. Two interesting snapshots of Fearnan’s past have come to light in the last week or so, and both have come from overseas. The first came via Valarie McDonald from New Zealand. Valarie’s great, great uncle, Peter McEwan, lived in Fearnan in Lawers View (now Andy Burt’s house and Pottery) early in the last century. Valarie’s branch of the family came from Brechin and her grandfather (Neil McDonald) emigrated to New Zealand in 1909 where he worked as a gardener. 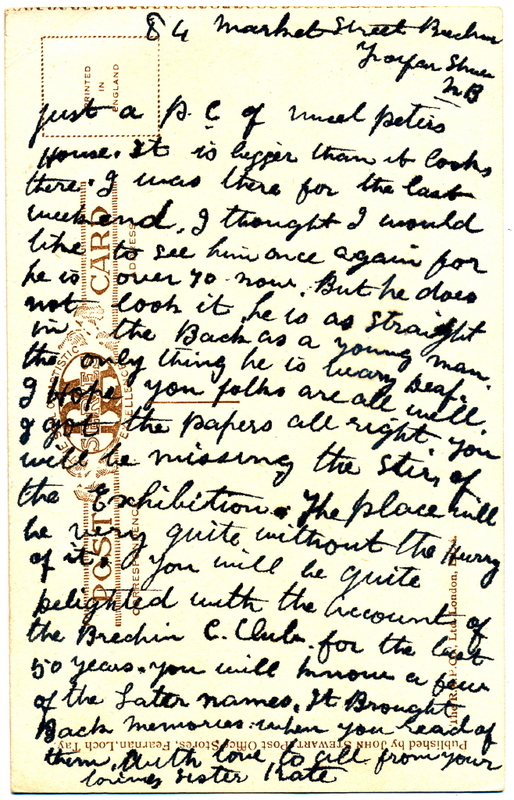 The family kept in touch by post and Valarie has an old postcard sent to her grandfather by his sister, following a visit to Fearnan. “Just a pc of Uncle Peter’s house. It is bigger than it looks there. I was there for the last weekend. I thought I would like to see him once again for he is over 70 now. But he does not look it, he is as straight in the Back as a young man, the only thing he is very deaf. I hope you folks are all well. I got the papers all right. You will be missing the stir of the Exhibition. The place will be very quiet without the hurry of it. You will be quite delighted with the account of the Brechin C. Club for the last 50 years. You will know a few of the later names. It Brought Back memories when you read of them. With love to you all from your loving sister Kate. The second contact was, in fact, an overseas order for Ian McGregor’s book from Jim Barnett in the USA, sent along with some thoughts on Fearnan. (Jim’s brother Alistair sent the website some memories of his childhood in Fearnan in July of this year). “I have been following the goings on at the FVA (through the web site) for some time now. I enjoyed the article on the golden eagle ‘Fearnan’. I was a wartime evacuee from Glasgow who adopted Perthshire as my home. We lived at Thistle Cottage from 1940-46 then at Balnearn. We were there over the blizzard of 1947. In the summers, I worked at Drumglass with Callum McDiarmid, went on to Lawers School of Agriculture at Comrie, then worked at Culdaremore with Jack Fisher. Sandy Butters was my mentor and surrogate father, mine being off to Dunkirk and subsequently killed in Greece. I have a very strong attachment for Fearnan in spite of Miss Purves*; stayed at Tigh-an-Loan on one of my return trips, then later at Letterellen. One of my companies is Crannog Holdings LLC, and you can guess where that came from! Duncan MacLaren was one of my close boyhood friends. *Miss Purves was a teacher at Fearnan primary school whose strictness is not-so-fondly recalled by a number of her former pupils who have been in touch with us! Can anybody build on these connections? Sorry Carol, I’m afraid we didn’t do a calendar this year – we did the Christmas card instead. Maybe next year……………. Best wishes, Fiona. Is there a contact e-mail address for Valarie McDonald. I am Peter McEwen’s great grandson. I spent the early years of my life at Lawers View.